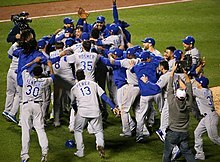 For historical Kansas City baseball franchises, see List of past and present Kansas City sports teams. Picked by many[who?] 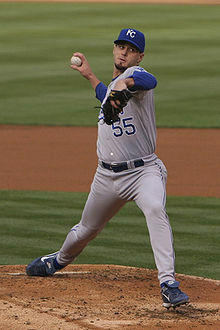 to win their division in 2004 after faring well in the free agent market, the Royals got off to a disappointing start and by late June were back in a rebuilding mode, releasing veteran reliever Curtis Leskanic and trading veteran reliever Jason Grimsley and superstar center fielder Carlos Beltrán for prospects, all within a week of each other. The team subsequently fell apart completely, losing 104 games and breaking the franchise record set just two years earlier. The Royals did, however, see promising seasons from two rookies, center fielder David DeJesus and starting pitcher Zack Greinke. The team continued a youth movement in 2005, but finished with a 56–106 record (.346), a full 43 games out of first place, marking the third time in four seasons that the team reestablished the mark for worst record in franchise history. The season also saw the Royals lose a franchise record 19 games in a row. During the season manager Tony Peña quit and was replaced by interim manager Bob Schaefer until the Indians' bench coach Buddy Bell was chosen as the next manager. Looking for a quick turnaround, general manager Allard Baird signed several veteran players prior to the 2006 season, including Doug Mientkiewicz, Mark Grudzielanek, Joe Mays and Scott Elarton. Nevertheless, the Royals struggled through another 100-loss season in 2006, becoming just the eleventh team in major league history to lose 100 games in three straight seasons. During the season Baird was fired as GM and replaced by Dayton Moore. As of 2012[update], the Royals affiliate radio station is KCSP 610AM, the station having entered into a new four-year deal starting from the 2015 season. The radio announcers are Denny Matthews and Ryan Lefebvre, with Steve Stewart and Steve Physioc. ^ "Kansas City Royals 1924". Newspapers.com. 1924-06-07. Retrieved 2018-11-04. ^ "Kansas City Royals 1947". Newspapers.com. 1947-10-20. Retrieved 2018-11-04. ^ Nelson, Curt. "Jackie Robinson: Kansas City Royal? | Kansas City Royals". Mlb.com. Retrieved 2018-11-04. ^ "7 Jun 1924, Page 5 - The Chillicothe Constitution-Tribune at". Newspapers.com. 1924-06-07. Retrieved 2018-11-04. 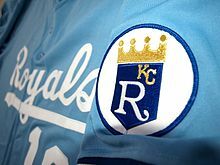 ^ "Royals board approves team sale to Prentice group". Archived from the original on 2012-11-06. ^ Flanagan, Jeffrey. Royals reach to past with newest slogan[dead link] Kansas City Star, February 28, 2007. 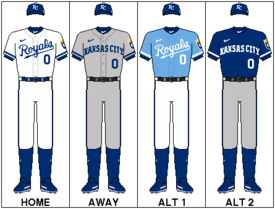 Wikimedia Commons has media related to Kansas City Royals.